looking to increase the number of catches you see throughout the day, then it may be worth purchasing yourself a fish finder. Fish finders are essentially personal sonar devices that work by projecting a transmission into a transducer which then converts the electrical current into a sound wave. This sound wave would be sent down into the water and returns after reflecting off of objects such as a fish or the terrain. The length of time it takes helps to depict the shape and size of the object as well as its location. This makes it significantly easier to determine the location of the fish as well as the species and number. This review basically aims to provide a comprehensive overview of one of the more popular entry-level fish finder currently available on the market and establish whether or not it would be a good fit for you. With the Signstek FF-003 Portable Fish Finder in your kayak, you can paddle to where the fishes are. The transducer can easily be cast into the water, as it comes with a float, or you can mount it to your kayak. Dual-beam sonar frequency: This device has a frequency of 83 kHz and 200 kHz to allow switching between large fish arch searches or specific fish targeting. Powered by four AAA batteries: For the product to work at its best, make sure that you load it with four AAA batteries before even leaving for a fishing expedition. It is also advisable that you carry some extra pieces, especially if you plan to do long-hour fishing. Multiple sensitivity levels: The product comes with 100 levels of sensitivity settings, which is great for some as it can assist them to get clearer images but might concern others as the learning curve becomes difficult. 2.8” TFT LCD 512 color screen: The device provides a clear display of the sonar readouts, and its brightness can be adjusted from 10% to 100% and vice versa for you to be able to save on battery or work at low-light conditions. Shallow and deep water fishing: The device has a depth range of two to 240 feet, which means that you would be able to detect different species of fishes. It also has a seven-meter cable as well as an auto-zoom bottom tracking system that help accomplish both kayak and shore fishing. IPX4 Rating: With a waterproof rating level of IPX4, any water that touches the surface of the unit will not affect it. 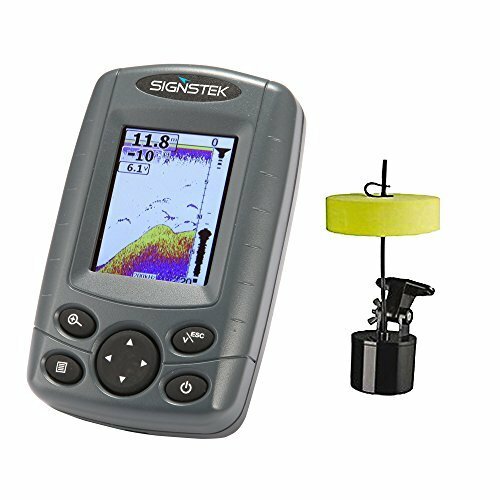 The Signstek FF-003 is a great entry-level fish finder that offers a bunch of features to increase the catch rate of all levels of fishing enthusiasts, especially beginners. The water resistance is a nice feature to have if you’re shore fishing but isn’t ideal for kayakers or boat fishers as there is a significantly higher probability that it’ll encounter large amounts of water or even full submersion. Nonetheless, purchasing a waterproof bag or pouch might be helpful. It has a great maximum depth range of 240 ft as well as auto-zoom tracking which are great features to find on such an affordable unit. Accompanied by a seven-meter cable, this unit will happily sit offshore or troll behind the back of a kayak without too much disturbance to the transducer. This allows a stable projection of either at an 83 kHz or a 200 kHz transmission which then returns the information and clearly displays it on the compact, yet bright and colorful 2.8” TFT LCD screen. Looking for a fish finder with similar features to that of the Signstek FF-003 but you want to try something new? Perhaps it’s worth taking a look at the Lowrance Hook-2. The Lowrance Hook-2 features a larger display at four inches as opposed to the Signstek FF-003 2.8-inch screen. Users will also benefit from its autotuning sonar as this means that there is no more need to continuously alter settings because the Lowrance system will automatically do this for you. This unit also uses a bullet transducer, which is great for kayaks or boats with limited console space as well as excellent as a basic GPS plotter or purely for fish finding. For those of you who want a fish finder with a few more features, then the Raymarine Dragonfly 5 Pro might be what you’re looking for. It features an optically bonded HD backlit LED screen that is really difficult to come across in similar models. It also has a dual-channel sonar with CHIRP DownVision and a second CHIRP conventional sonar channel for photo-like images and fish targeting, respectively. You can even live stream your sonar data straight to your smartphone while using the Raymarine’s Wi-Fish app which you can then save and send to friends. The Signstek FF-003 is an excellent fish finder for those who are just starting out. You may not get all of the bells and whistles offered by more expensive models, but you certainly get a great assortment of features befitting its price. The main downside to this unit is its water resistance level which makes it perform fairly during kayak fishing but works excellently for shore fishing. Nonetheless, it can be mounted to a boat’s console where it is less likely to encounter large quantities of water. Overall, it’s a great starter unit and should definitely help you increase your number of catches as well as help you plot your favorite fishing spots.